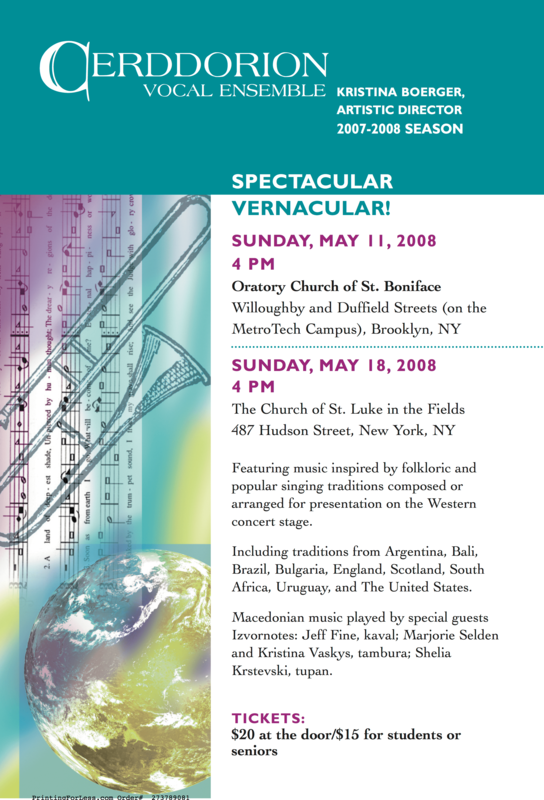 Click on the concert title to view a PDF of the program. Works evoking the moods and motions of water. Including compositions by Victoria, Monteverdi, Elgar, Barber, R. Murray Schafer, and the winners of Cerddorion’s sixth annual Emerging Composers Competition. Seldom-performed works by the foremost American composers of the 20th century. 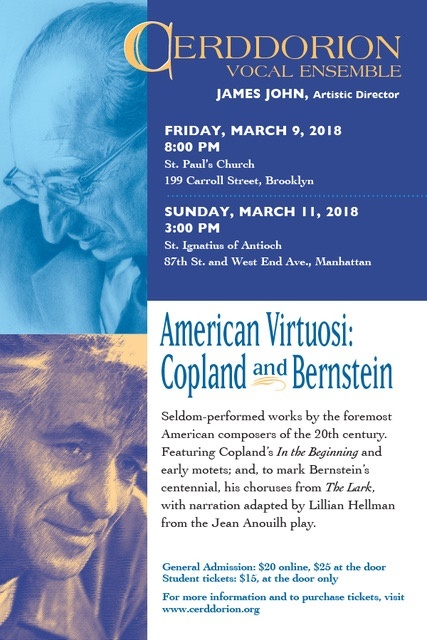 Featuring Copland’s In the Beginning and early motets; and, to mark Bernstein’s centennial, his choruses from The Lark. With narration by acclaimed actress Phumzile Sitole. Music in the Lutheran tradition, to mark the 500th anniversary of the Protestant Reformation. 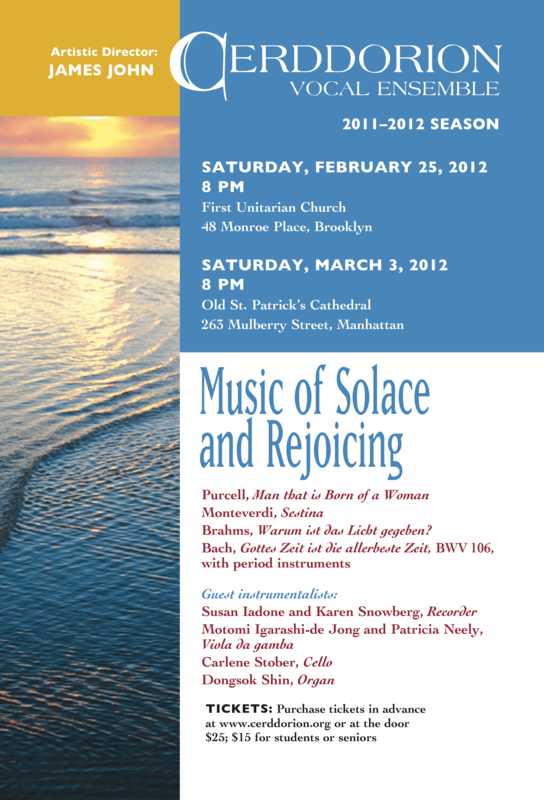 With works by Josquin, Sweelinck, Schütz, Bach, Brahms, and Distler. 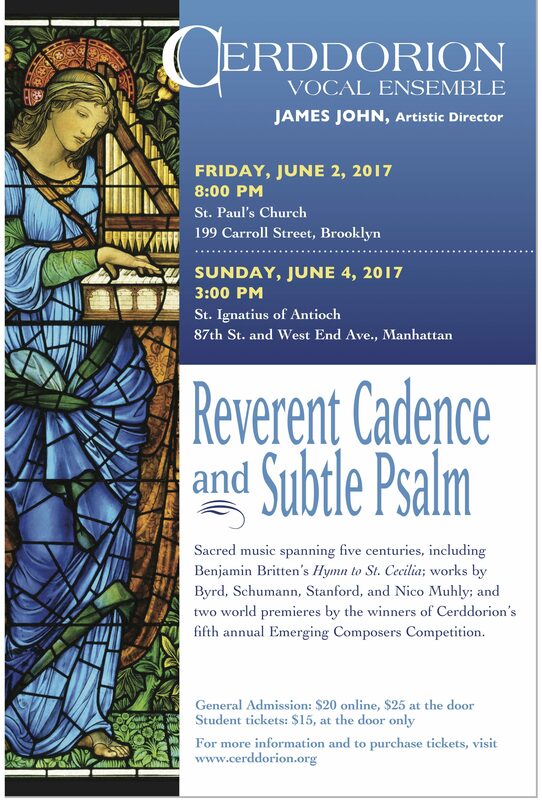 Sacred music spanning five centuries, including Benjamin Britten’s Hymn to St. Cecilia; works by Byrd, Schumann, Stanford, and Nico Muhly; and two world premieres by the winners of Cerddorion’s fifth annual Emerging Composers Competition. 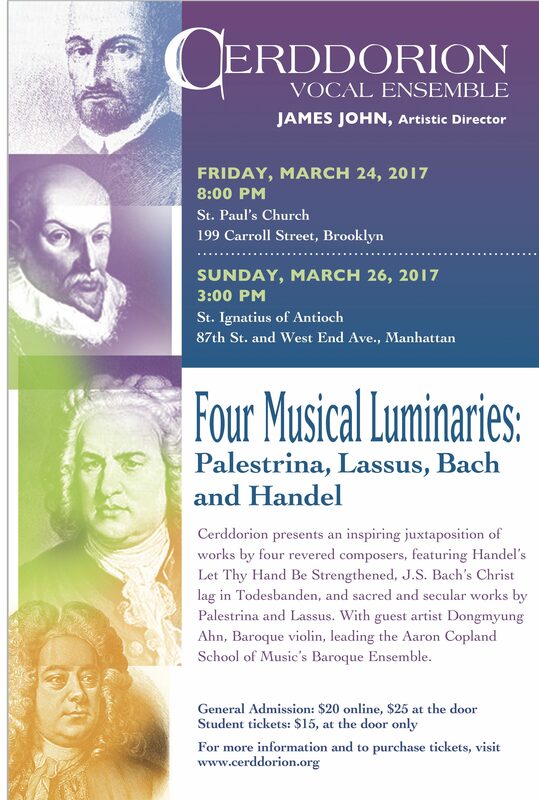 An inspiring juxtaposition of works by four revered composers, featuring Handel’s Let Thy Hand Be Strengthened, J.S. Bach’s Christ lag in Todesbanden, and sacred and secular works by Palestrina and Lassus. With guest artist Dongmyung Ahn, baroque violin, leading the Aaron Copland School of Music’s Baroque Ensemble. Works exploring Spain’s musical influence on Latin America, including pieces by Victoria, Guerrero and Morales, Sumaya’s extraordinary Lamentations of Jeremiah, and lively arrangements of Brazilian folk and popular music. With special guests Kaufman Center’s SMS High School Advanced Women’s Choir, Emily John, Director. Music resplendent with images of night, stars, the moon, and the radiance of evening, featuring Brahms’s Fünf Gesänge, op. 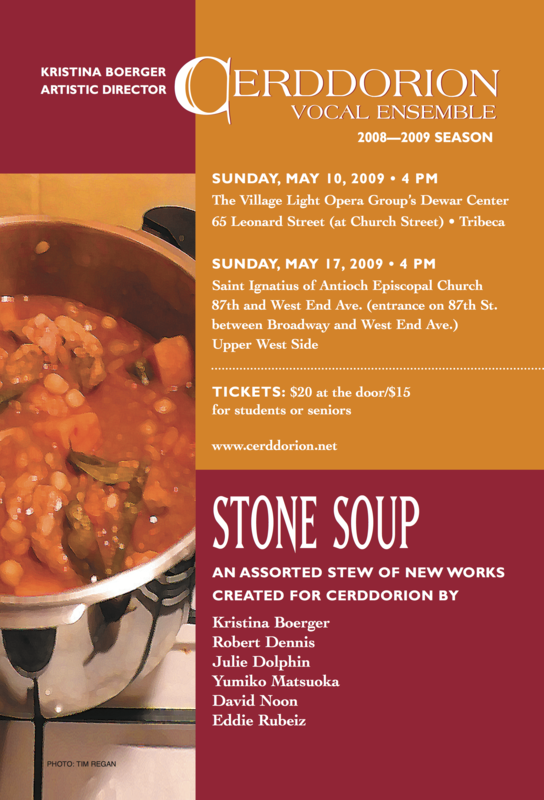 104, madrigals by Monteverdi and John Wilbye, a world premiere by Los Angeles composer David Stern; and the winner(s) of Cerddorion’s fourth Emerging Composers Competition. 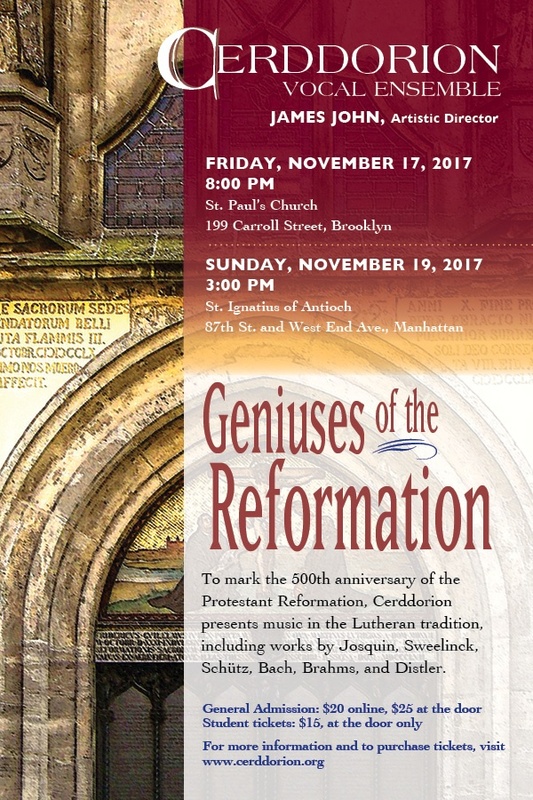 One of music’s greatest luminaries, Josquin inspired Martin Luther to declare him “master of the notes, which must do as he wishes.” Our program explores the profound scope of this extraordinary composer’s career, including selections from four of Josquin’s mass settings, several motets, and secular works. 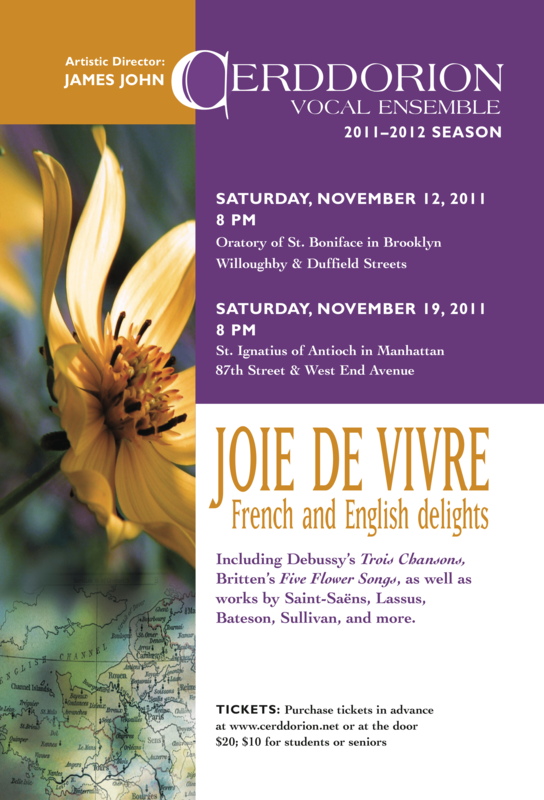 Works that explore the depth and volatility of human passion, including madrigals by Carlo Gesualdo and Thomas Tomkins; Clément Janequin’s La Guerre; New York composer Kim Sherman‘s Graveside; and Jeffrey Van’s setting of Civil War poems by Walt Whitman, A Procession Winding Around Me, with guest artist William Anderson, guitar. Music spanning five centuries inspired by the abiding, passionate love expressed in these timeless biblical texts. Featuring music of Melchior Franck, John Dunstable, Francisco Guerrero, William Billings, Edvard Grieg and Bengt Johansson, as well as the premiere of new works by Craig Bakalian and Francisco José Carbonell, winners of Cerddorion’s Third Annual Emerging Composers Competition. 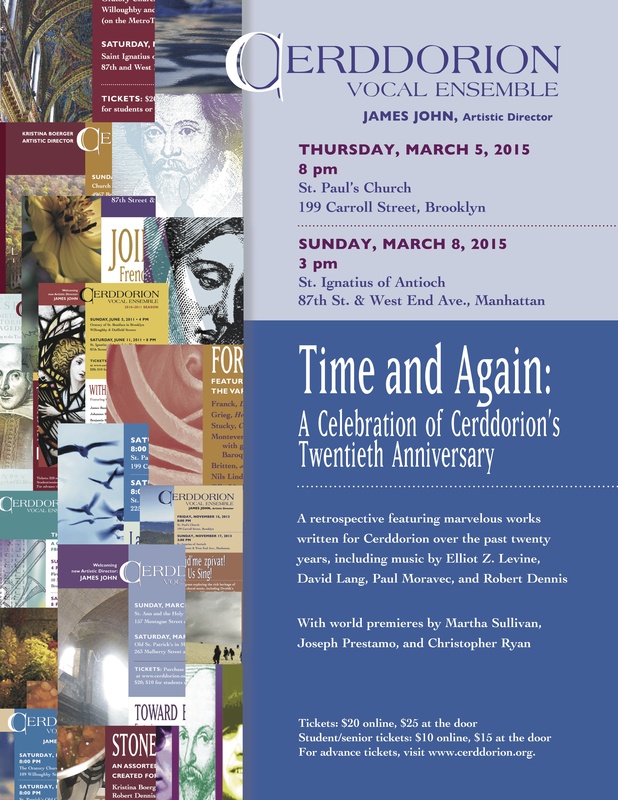 A retrospective featuring mavelous works written for Cerddorion over the past twenty years, as well as world premieres by Martha Sullivan, Joseph Prestamo and Christopher Ryan. Beloved works by Orlando di Lasso and J.S. 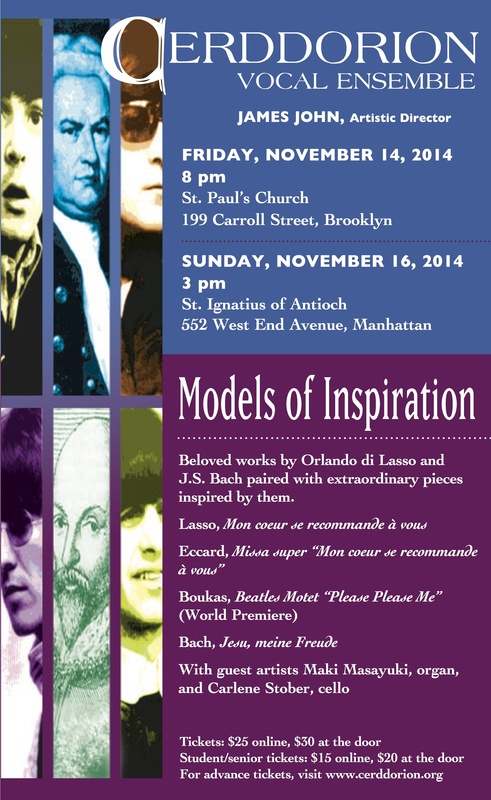 Bach paired with extraordinary pieces inspired by them. Featuring Bach’s beloved motet Jesu, meine Freude as well as the world premiere of the Beatles Motet “Please Please Me” by Richard Boukas. Choral settings of Shakespearean texts, including selected readings from the Bard’s plays and poetry alongside music of Vaughan Williams, Jaakko Mäntyjärvi, Sven Hagvil, and a host of New York area composers: Nancy Wertsch, Joseph Prestamo, Steven Sametz, Robert Applebaum, Martha Sullivan, Matthew Harris, and a world premiere by Cerddorion’s own Christopher Ryan. 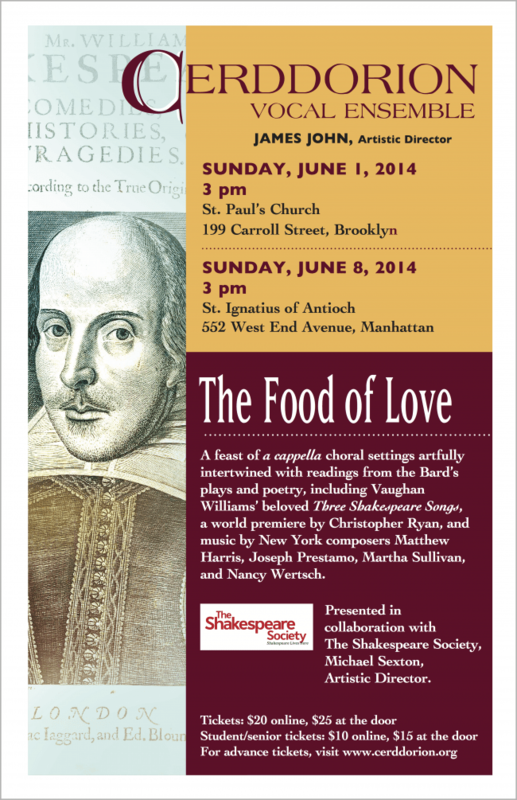 Presented in collaboration with New York’s Shakespeare Society. 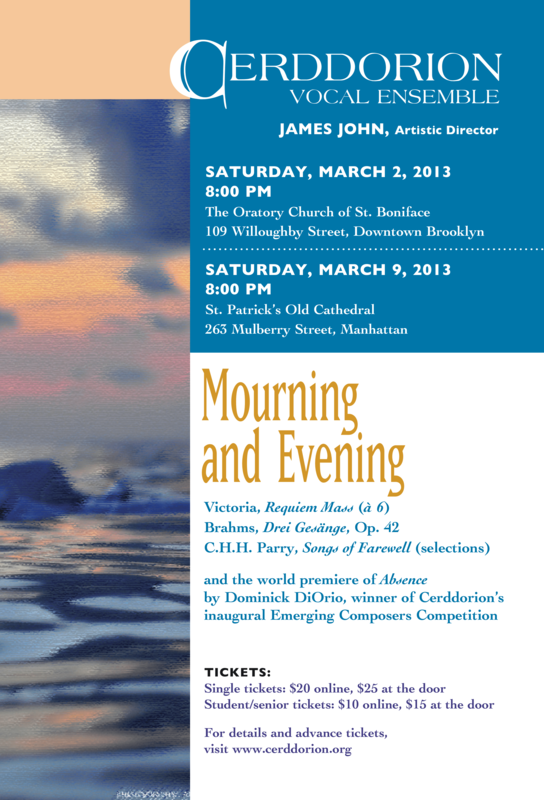 Jannequin’s Chant des Oiseaux, music for choir and string quartet by Veronika Krausas, and world premieres from Steven Serpa, Joshua Fishbein and Theo Popov, winners of Cerddorion’s second Emerging Composers Competition. Presented in collaboration with the contemporary ensemble Face the Music. 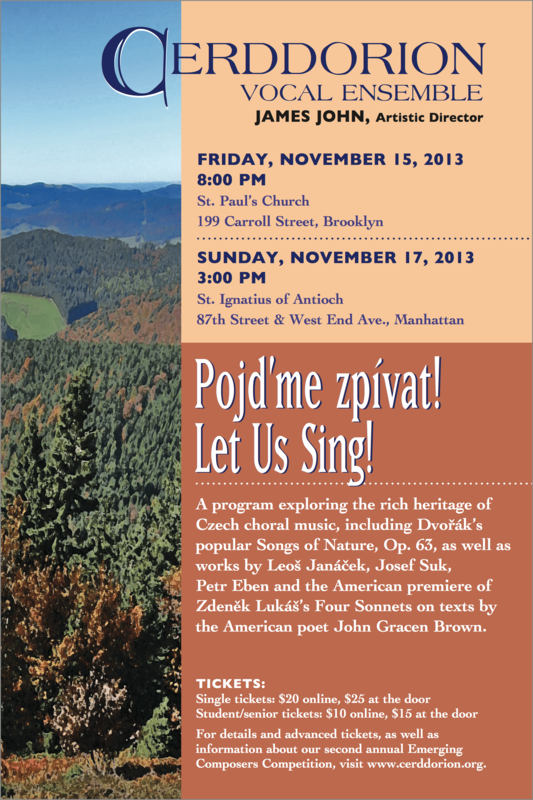 An all-Czech program, featuring Dvořák’s Songs of Nature, Op. 63, works by Petr Eben, Leoš Janáček, and Josef Suk, and an American premiere by Zdeněk Lukáš. 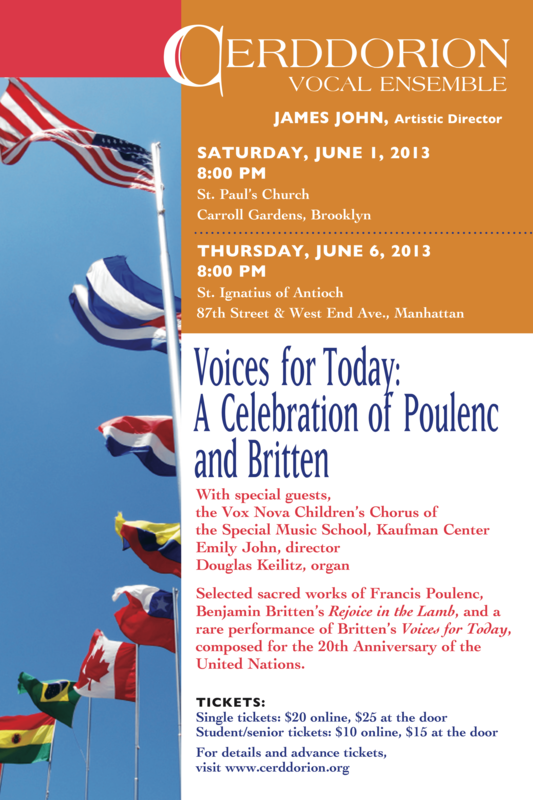 Selected sacred works of Francis Poulenc, Benjamin Britten’s Rejoice in the Lamb, and a rare performance of Britten’s Voices for Today, composed for the 20th Anniversary of the United Nations. With special guests, the Vox Nova Children’s Chorus of the Special Music School, Kaufman Center, Emily John, director. Tomás Luis de Victoria’s exceptionally beautiful six-voice Requiem Mass, Brahms’ serene and deeply moving Drei Gesänge, Op. 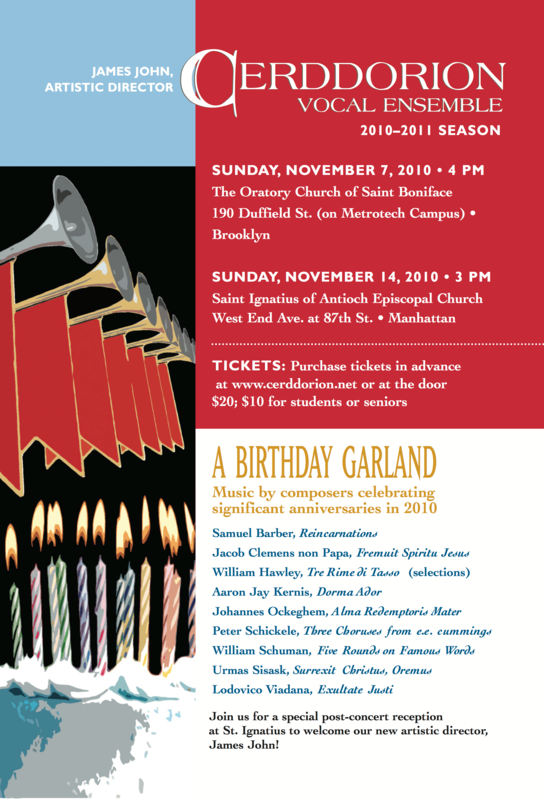 42, as well as the Dominick DiOrio’s Absence, winner of Cerddorion’s inaugural Emerging Composers Competition. 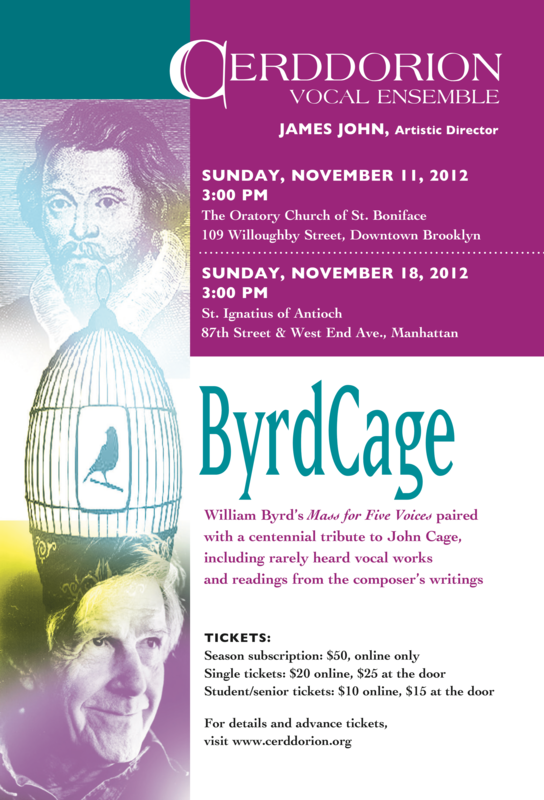 William Byrd’s Mass for Five Voices, and a 100th Birthday tribute to John Cage, including rarely heard performances of selected vocal works, as well as readings from the composer’s writings. With special guest, actor Tom Ligon. 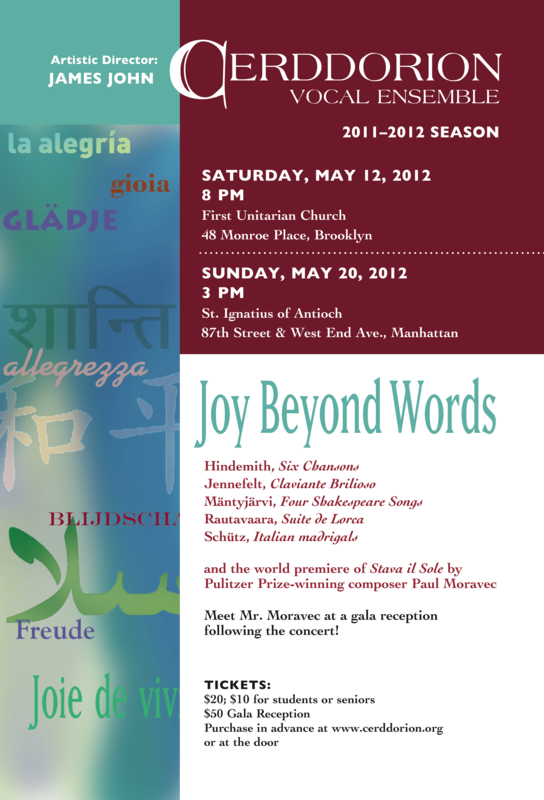 A program exploring the power of music to express universal truths beyond the limitations of language, including Jennefelt’s Claviante Brilioso, Rautavaara’s Suite de Lorca, Hindemith’s Six Chansons, Mäntyjärvi’s Four Shakespeare Songs, selected Italian madrigals by Heinrich Schütz, and a newly commissioned work by Pulizer Prize-winning composer Paul Moravec. Four contrasting works that reflect on the transience of life: Henry Purcell’s funeral anthem Man that is Born of a Woman, Claudio Monteverdi’s madrigal cycle Lagrime d’amante al sepolcro dell’amata, Johannes Brahms’s motet Warum ist das Licht gegeben?, and Bach’s Gottes Zeit ist die allerbeste Zeit, BWV 106, accompanied by period instruments. French and English delights, including Debussy’s Trois Chansons, Britten’s Five Flower Songs, as well as works by Saint-Saëns, Lassus, Morley, Batten, Sweelinck, Goudimel, Stanford, Sir Arthur Sullivan, and Scottish composer Hamish MacCunn. Music for the enchanting medium of harp and voice, including Benjamin Britten’s “Choral Dances” from Gloriana (with tenor Kurt Alakulppi), selected works by Stephen Paulus, Johannes Brahms’s Vier Gesänge, Op. 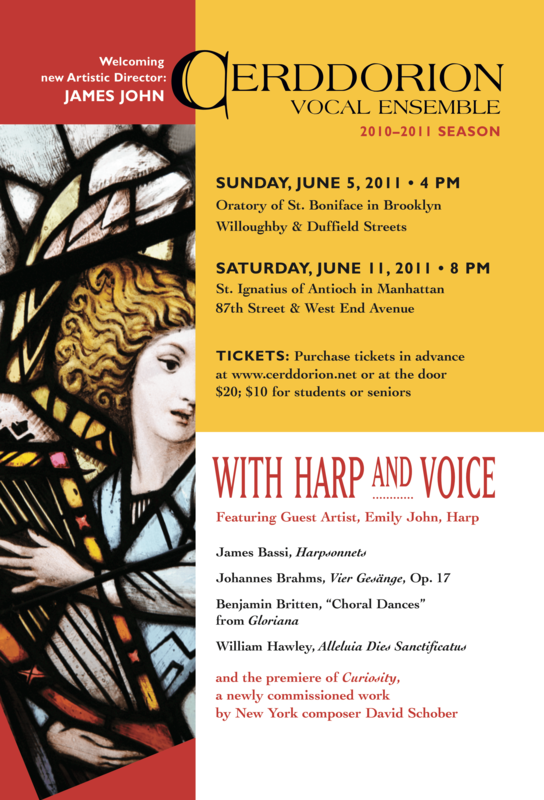 17, William Hawley’s Dies Sanctificatus, James Bassi’s Harpsonnets, and a world premiere for chorus and harp by New York composer David Schober. Featuring Guest Artist, Emily John, harp. 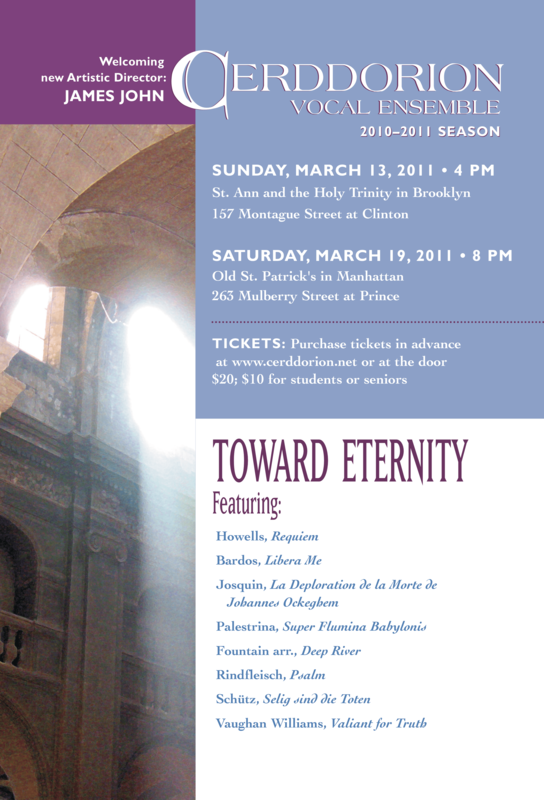 Choral works that evoke a spirit of peace, contemplation and serene beauty, featuring Herbert Howells’s profoundly moving Requiem, motets by Josquin, Palestrina and Schütz, Andrew Rindfleisch’s Psalm, Robert Fountain’s arrangement of Deep River, music by Hungarian composer Bárdos Lajos, and Vaughan Williams’s magnificent motet, Valiant for Truth. 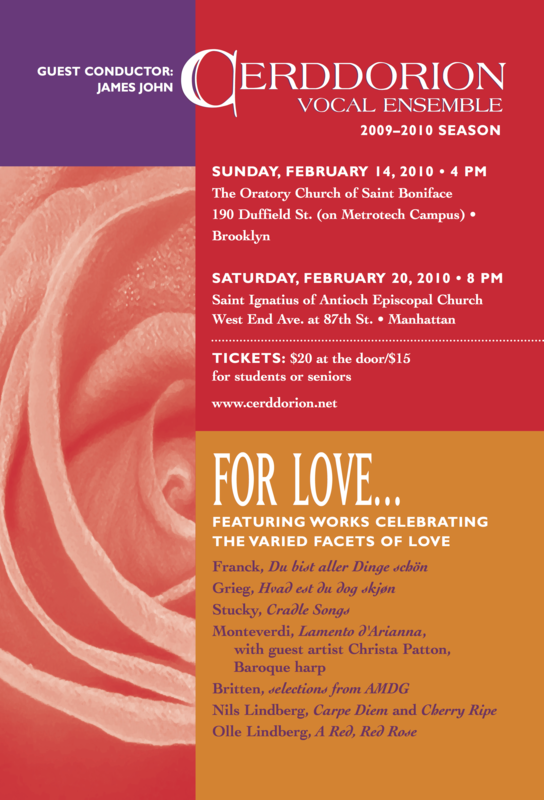 Music by composers who celebrated significant anniversaries in 2010, including Samuel Barber (Reincarnations), Johannes Ockeghem (Alma Redemptoris Mater), William Hawley (Tre Rime di Tasso), Peter Schickele (Three Choruses from e.e. cummings), William Schuman (Five Rounds on Famous Words), Aaron Jay Kernis (Dorma Ador), motets by Clemens non Papa and Ludovico Viadana, and works by Estonian composer Urmas Sisask. 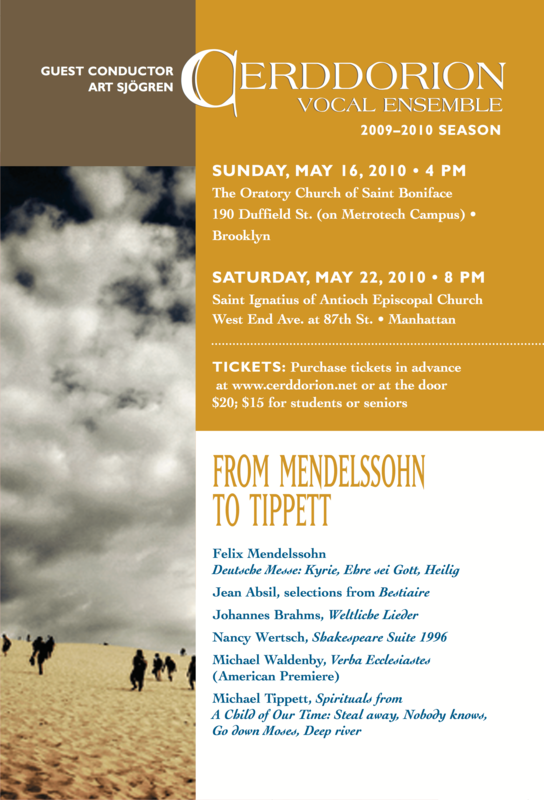 Choral works by Mendelssohn, Brahms, Jean Absil, Michael Tippett, and Nancy Wertsch, as well as the New York Premiere of Michael Waldenby’s Memento Creatoris tui, composed in 2009. Motets by Melchior Franck and Edvard Grieg, Monteverdi’s madrigal cycle Lamento d’Arianna, selections from Britten’s A.M.D.G., Steven Stucky’s Cradle Songs, and settings of love lyrics by contemporary Swedish composers Nils and Olle Lindberg. 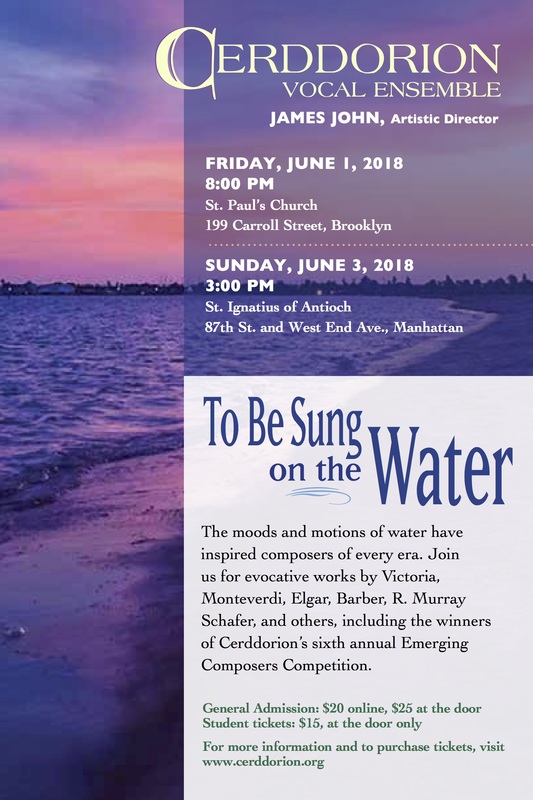 An eclectic program covering five centuries of music honoring the Virgin Mary, from Gregorian chant to the choral songs of the Ba-Benzélé pygmies in Congo, including works by Bruckner, Howells, Parsons, Pärt, Stravinsky, Swayne, Tavener, Victoria, Villette and Walmisley. An assortment of new works created for Cerddorion including a world premiere mini-oratorio by Julie Dolphin, as well as works by Boerger, Dennis, Matsuoka, Noon and Rubeiz. 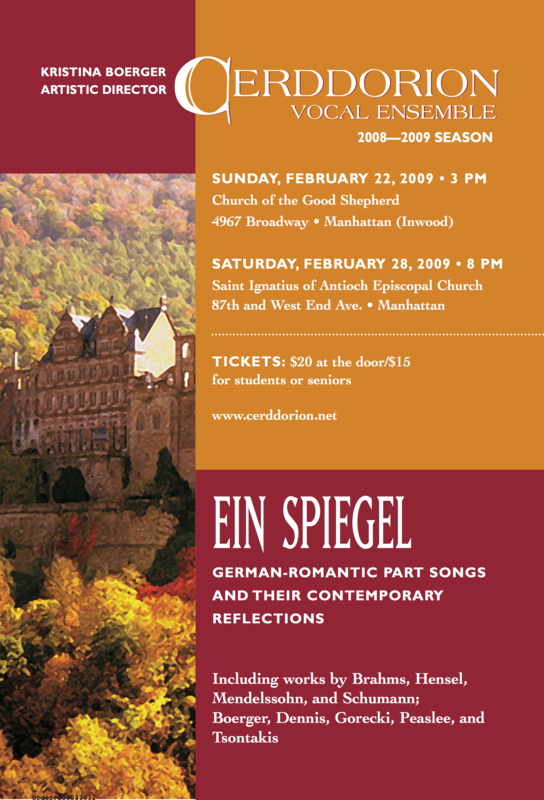 Featuring 19th century German Romantic part-songs paired with contemporary works. Hensel, Mendelssohn, and Brahms are set beside current works by Dennis, Peaslee, Boerger, and Gorecki. Traces English choral music from liturgical chants through composers Dunstable, Tallis, Byrd, Elgar, Britten and more. A melange of vernacular music arranged for the concert stage, drawn from many countries and traditions. Guest performance by the Macedonian ensemble Izvornotes. Features sacred and devotional works by tunesmiths and composers from the United States.